Tucker Carlson is right on in identifying the pathetic exhibition Democrats have created out of our border enforcement. It’s by design, in an assault begun by Senator Kamala “Commiela” Harris in mid-May hearings when she badgered and attempted unsuccessfully to intimidate and malign Homeland Security Secretary Kirstjen Nielsen. 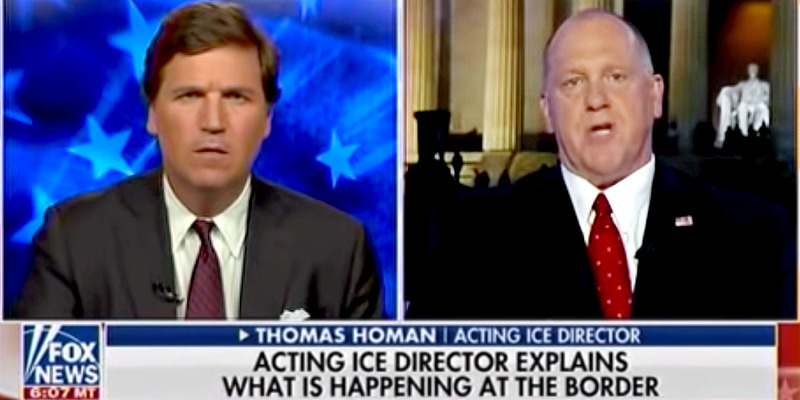 Carlson points out, ‘They’re great at yelling and a preening, not so good at fixing.” He asks acting Ice Director Thomas Homan for is take on being compared to the Nazis and the internment of Japanese American citizens during World War II. Homan says it’s “an insult to the brave men and women of the Border Patrol and ICE, to call law enforcement officers the Nazis. They’re simply enforcing laws enacted by Congress.” He notes that there’s none of this outrage, phony as it is, over the deaths of children at the hands of illegal invaders. 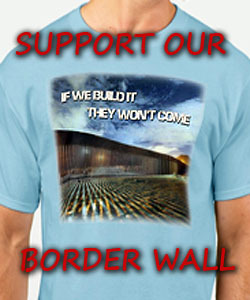 He tells the bleeding heart libtards in Congress to protect Americans before they worry too much about illegal aliens. Homan calls out the dishonest of the libtard media who claim that the Trump administration is using the squatter kids as pawns, noting it’s not the Trump administration that is on the border turning it into a circus sideshow. He notes that the claims underlying the mass influx have been denied 80 percent of the time as frivolous by the courts. That’s not being reported by the leftist media either. He addresses the human shield aspect of what is happening, saying, “These parents themselves are using these children as pawns to gain entry into the United States, knowing that we can’t detain them. He says the parents are to blame for the separation of the family members, that it is a choice they have made, choosing not to cross at a port of entry, aware of the likely result. If you’re also fed up with Facebook Gestapo tactics of censorship and kicking conservatives off of their platform for telling the truth, look for me on https://gab.ai/RickRWells, on MeWe, and on my website https://RickWells.US – Please SUBSCRIBE in the right sidebar at RickWells.US to receive my posts directly by email, safely beyond the censorship of Nazi Mark Zuckerberg and his thought and speech Gestapo goons. Thanks for reading my work. This is disgusting – they brainwash their constituancy but worst of all THEY ARE USING CHILDREN FOR POLITICAL REASONS. I find it ironic that both groups of democrats went to the SAME facility. Donuts to dollars they wouldn’t go near that border though, which is EXACTLY where they should be and they should go on a night time ride-a-long with the agents too but then they probably wouldn’t last but 5 minutes. AGAIN, THEY ARE USING THESE CHILDREN FOR THEIR OWN POLITICAL GAIN, DEAR LORD, WHY CAN’T THEIR CONSTITUANCY SEE THAT? PLEASE OPEN THEIR EYES TO THE TRUTH. AMEN!